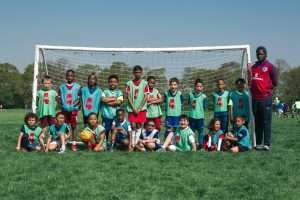 Sports Fun 4 All run weekly football coaching sessions in Catford, SE6 and Downham, BR1. To make Lewisham the most physically active borough in London. To get 1,000 more people more active by 2020. To help inspire Lewisham residents to be more physically active and develop a lifelong love of sport. Set up in 2015, we initially started off delivering two funded football projects at Bellingham Green and Downham Health & Leisure Centre. Once the funding finished in December 2016 there was so much demand from the players and parents we decided to continue these sessions as paid sessions. We moved the Bellingham Green Session to Goldsmiths Community Centre but after much success we outgrew this and moved to Forster Memorial Park in April 2017. 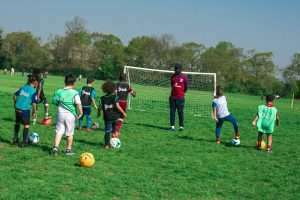 In June, we started at a Sunday session and now run three weekly football sessions. We hope you enjoy our website and feel inspired to start your sporting journey with us! My son Tobias started sports fun4all, almost a year ago when he was just three. Coach Kieran (and more recently Adrian too) provide positive encouragement to learn new skills whilst challenging him. He has grown in confidence socially as well as physically since he started. The informal drop in sessions are great and the age range of the children encourages some of the older children in the group as “mini mentors” for the younger ones. Kieran has a great passion to develop all the children. This is evident as he is sure to know all the children by their name and draw them into activity throughout the sessions with respect to their age/abilities. Thoroughly recommend sports fun for all. My son loves going on Saturday to play football. He's always the first one up to get ready. I have definitely noticed a different in his social skills and discipline. Thank you Kieran for your discipline and consistency in being there every Saturday. You are a role model to the children. My son's been with sports fun for all since 2016 And he absolutely loves it! Kieran is excellent with all the kids no matter what age. There training every weekend come rain or Shine! My son never wants to miss a day. Would highly recommend sports fun for all to boys or girls who want to have fun and further there abilities. The dedicated and great support from the coaches, has enabled my son's confidence behind the ball to come on leaps and bounds within a matter of years. My witnessing a relaxed and fun atmosphere for all kids, has me thoroughly recommending you give Sport fun 4 all a try! It's a real positive and nurturing environment, that has seemed to create a real sense of comradery for the kids involved! A great local event! The sessions make for good week day or weekend - meaningful activity, and are reasonably priced! We were new to the area so I took my Son and Daughter to the Saturday morning session to make friends and avoid 'screen time'. The sessions are drop-in, very accessible and friendly and don't require you to pre-book or commit to paying monthly etc The coaches took the time to ensure that both my kids were made to feel welcome from the off. My son is now regularly playing in matches and looks forward to going at the weekends. Recommended. 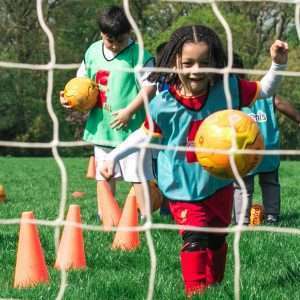 Since joining secondary school my daughter decided to show more of an interest playing football in tournaments for her school and her PE teacher suggested we find a football club outside of school for more practice. Sportsfun4all came up first when I searched the Lewisham website and I called and spoke to Kieran with plenty of questions as we wanted to find out if there were other girls the same age and Kieran told us to come along. Forster park we knew really well and I liked the fact that sportsfun4all is flexible, you can turn up on either a Saturday or Sunday morning not having to commit to any subscription or upfront costs! My daughter enjoyed her first time playing football with the other kids, there are mixed ages and abilities, some weeks she may have been the only girl but she still enjoyed herself and learnt a lot of skills and techniques and listened to Kieran's advice for her school tournaments and most of all got some exercise in the fresh air. My nephew Jay enjoys attending the football sessions twice a week, which are very engaging and promote team work skills. Jay has become more confident as an individual since he started Sport Fun 4 All in October 2018. Sadly Jay lost his mum in August 2018 and integrating with the kids at football has helped him deal with this life changing experience. I applaud Kieran and Adrian for the sterling work they do with these young children every week, come rain or shine. They are excellent role models and I can highly rate Sports Fun 4 All if you are looking for a good football club. My son loved the Sunday coaching sessions. Sports Fun 4 All helps develop technical skills and a good teamwork ethic in a very inclusive environment. He enjoyed the sessions and wants to continue playing now that we have moved out of the area. I was delighted how the coaches covered such a wide range of ages and abilities with a really positive and professional attitude.